Would you like to learn what’s going on in and around Cromer? Would you like to help your local community? With over 100 different volunteering opportunities known in the local area, the North Norfolk Volunteer Hub would like to invite you to come and find out about what you can get involved in. Volunteering can greatly benefit you as it allows you to learn new skills, help others and is an excellent addition to your CV. Above all, it’s great fun and you get to meet loads of interesting people! Come along on either Tuesday 16th April, 12pm – 4pm or Wednesday 17th April, 9am – 12pm to talk to a member of our Volunteer Hub team, enjoy refreshments and discover what would be the best use of your time and interests. We have a display in our window at the front of our building for the Christmas period. This contains useful information about the local area such as events happening on Christmas Day, useful telephone numbers and organisation’s opening times between now and the New Year. If you are in need of any advice whilst we are closed, please have a browse of our display and see if this can help. We will be closed from Friday 21st December and will be back open on Wednesday 2nd January 2019. Have a very Merry Christmas. Merchants’ Place will be closed over the Christmas period from 5pm Friday 21st December until 9am Wednesday 2nd January 2019. We look forward to seeing you all in the New Year! Thank you for your ongoing support. We will also be closing at 12:15pm on Wednesday 19th December and will be back open as normal on Thursday 20th December 2018. A new evening art class will be starting 8th January 2019 at Merchants’ Place. The class will run every Tuesday evening between 7pm – 9pm and will run in 5 week blocks. £70 for 5 weeks with refreshments and art supplies included. Students are asked to bring an A3 sketch pad along with them for the course. Get in touch today for more information or to book your place – limited spaces available – booking essential – money to be paid in advance – class for adults. On Saturday 15th December, an interesting art workshop will be running at Merchants’ Place. Join our local and experienced artist and create something to take home with you or to give as a gift for Christmas. Get in touch today to book your place – £20 for the workshop – booking essential – £10 deposit required when booking – workshop for adults. 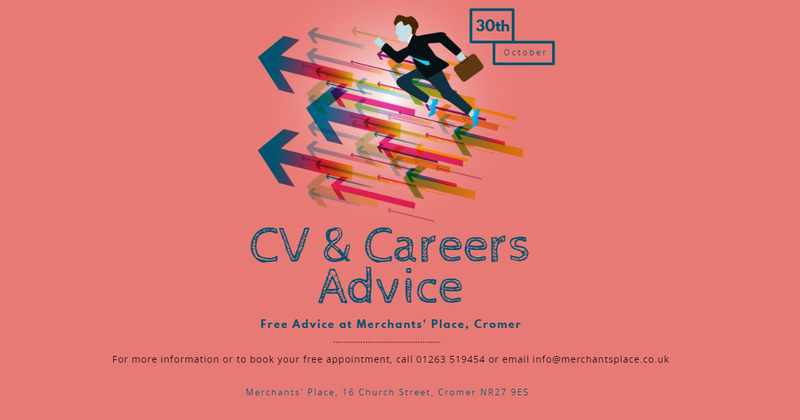 Merchants’ Place are offering free employment advice appointments on Tuesday 27th November where our advisor can help you with subject such as CV advice, general careers advice, interview skills, apprenticeship advice, confidence building and job search. If you would like to book an appointment, contact us today by calling 01263 519454 or by emailing info@merchantsplace.co.uk. The NCLS course “Coding” which was due to start on Wednesday 7th November at 6:30pm has been cancelled. Book your free appointment to see our experienced and professional careers advisor here at Merchants’ Place. The next appointments are available for Tuesday 30th October 2018. Call us now on 01263 519454 or email info@merchantsplace.co.uk to book your place. Limited spaces are available, so don’t miss out.